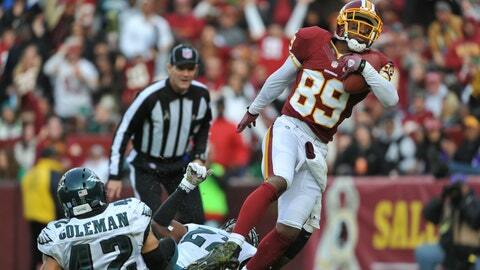 Washington Redskins wide receiver Santana Moss says it isn't a strech that the refs have been 'crap' this year. NFL officials haven’t exactly been at their best this season and people are taking notice, players chiefly among them. Washington receiver Santana Moss, who isn’t afraid to speak his mind, was asked about officiating across the league this season, and the 13-year veteran didn’t hold back in his criticism. "It’s probably been worse this whole year as a total, not just this team," Moss said, according to the Washington Post. "But I’ve watched a lot of football this year. It’s been the worst that I’ve ever seen." Moss, 34, could be a little biased in his opinion, considering Washington is a disappointing 3-9 this season, but he was also a firsthand witness to one of the worst officiating gaffes in recent memory – not counting the replacement refs – at the end of the Redskins’ game against the Giants last weekend. His presence on the field during the third down/first down confusion by the officials was likely what prompted the questions in the first place, but it seems pretty clear that the receiver has been thinking about the issue for some time. "I understand [there are] so many things being changed. But at the end of the day, some of that stuff is crap," Moss said. "So hopefully somebody who’s in a higher position that can really watch this season alone and see some of the stuff that’s being called and hasn’t been called, they can go and try to critique that, because it’s been the worst by far since I’ve been in the league." Moss’ comments likely won’t affect much change with officials, but it might cost him a little bit of money, if the league deems his comments inflammatory enough.